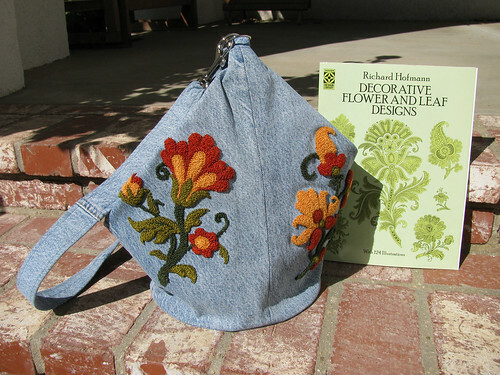 Richard Hoffman’s floral designs are perfect for punch needle embroidery. This little one strap back-pack is made from the leg portions of an old pair of jeans. It is bucket shaped, so will hold a lot. I put the designs into a photo editing software, removed all extra details, and then printed the designs onto iron-on transfers. The transfer acts both as a stabilizer for the denim fabric and as a glue to hold the stitches in place. Steaming the finished designs is all that is needed to glue the stitches down. More photos can be found on my flickr page. Just click the photo. This entry was posted on Friday, October 24th, 2008 at 7:17 pm and is filed under Embroidery and Sewing. Tagged: Embroidery, Punchneedle, Sewing. You can feed this entry. You can leave a response, or trackback from your own site.